with the creatures of the Abyss." When ascending the weapon, it will only be displayed as "Greatsword of Artorias", it will not say "cursed". To be certain of which sword is already created and which is being created, look at the stats which are unique. Since it is a cursed weapon, it can damage ghosts without the user being cursed. It can also block ghost attacks if used in the left hand, or with L1 if used with two hands. 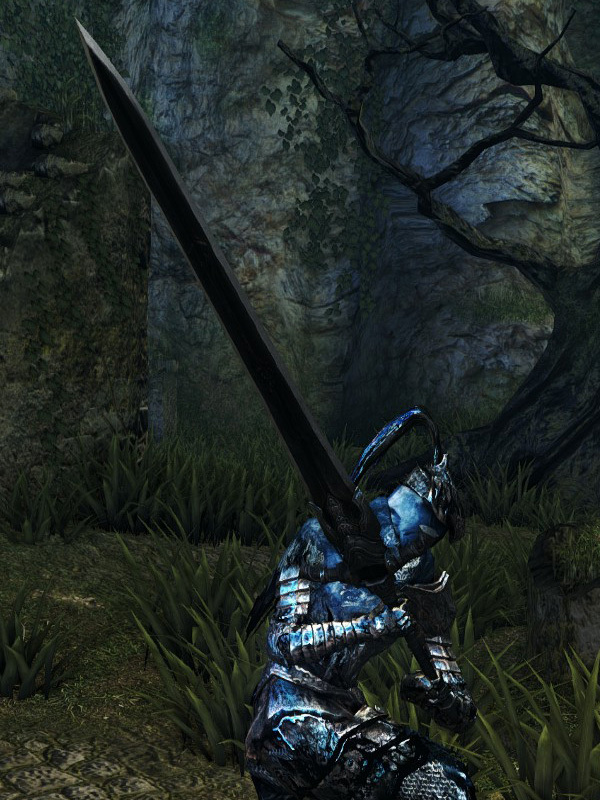 In the German translation, this sword is called "Großschwert von Artorias" (Greatsword of Artorias), while the non-cursed version is called "Finstertöter" (Darkslayer). Despite the "C" rating in Intelligence and Faith, the weapon does not receive any damage bonus from them. To wield the sword effectively however, users must meet both requirements. Requiring 18+ in four different stats means most builds will not likely be able to wield it effectively, since at least one of the four is usually not invested in. In particular, few builds tend to invest 18 in both Intelligence and Faith. In order to obtain the Knight's Honor Trophy/Achievement, this weapon, as well as Greatsword of Artorias is needed. 60% STR, 60% DEX, 60% INT, 60% FAI scaling.